The Blackwater Heritage State Trail extends from the historic town of Milton north to U.S. Naval Air Station Whiting Field. The trail passes through pine woods, a cypress/bay swamp and an area of white-topped pitcher plants. The trail offers an enjoyable trip through a quaint North Florida town and out into the countryside where there are creek crossings on wooden bridges. An unpaved equestrian trail parallels a segment of the paved trail. Location: Western Florida from Milton north to Whiting Field, Railtrail from south of Milton on U.S. Highway 90 north and east past Munson Hwy to Whiting Field. From I-10 take exit 26 at SR 191. Travel north on SR 191 to US 90 and turn left (west) to the intersection of US 90 and SR 87 North (about 2 blocks). Make a right turn onto SR 87N and then take the first right on to Elva Street. The trailhead is on the right. Follow directions to the Milton Trailhead and stay on SR 87N until you reach SR 191 (Munson Highway). Take a right onto SR 191 and go to the traffic light at Alabama Street. Turn left onto Alabama Street; the Visitor Center will be on the left after crossing the trail. Follow directions as given for the Visitor Center until you reach the intersection of SR 87N and SR 191. Proceed north on SR 191 for approximately 1.8 miles. The parking area is on the left. 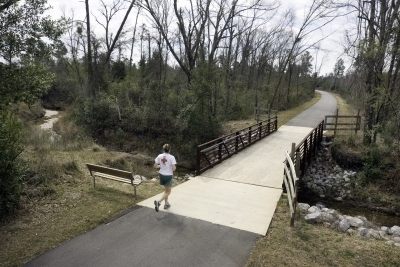 Managed by the Florida Park Service, the Blackwater Heritage State Trail is officially designated as part of the Florida's Statewide System of Greenways and Trails. The Board of Trustees of the Internal Improvement Trust Fund (Trustees) obtained title to property in 1993. The corridor was acquired from the U.S. Department of the Interior at no cost to the Trustees through the National Park Service's Lands to Parks Program. Two and a half acres adjacent to the Trail's Visitor Center, developed as a community trailhead park with a small maintenance area was funded by the Office of Greenways and Trails Acquisition Program, a component of Florida Forever. The property is leased to the park service through January 30, 2044. Development for the paving of the trail was funded by the Florida Department of Transportation. At its northern terminus, this 8.1 mile paved trail joins the 1.5-mile “Military Heritage Trail” which is managed by the U.S. Navy. Altogether, more than nine miles of paved trail offer an enjoyable trip through a quaint North Florida town and out into the countryside. Nine wooden bridges cross various streams and points along the way. The trail is mostly rural, but there are several street crossings. The trail passes the old Milton Fire Station, Milton City Hall, and the trail's Visitor Center. Further north, there are piney woods, a cypress/bay tree swamp, an area of white-topped pitcher plants and several creeks. Development for the paving of the trail was funded by the Florida Department of Transportation. The trail follows the path of the former Florida and Alabama railroad (F&ARR), which was owned and operated by Bagdad Land and Lumber Company. Built in the early 1900s, it extended from the lumber mill in Bagdad, Florida to Whirley, Alabama. The F&ARR supported the timber and lumber business in Bagdad from 1830 to 1939, at which time the line was closed. With the coming of World War II and the establishment of Whiting Field Naval Air Station, the rail line was rebuilt in the early 1940s to supply aviation fuel to the base. There are five parking areas located along the trail corridor. The Southern Trailhead has limited parking, restrooms and a water fountain. Located just off of US 90, one mile north, the Milton Trailhead features picnic tables and a gazebo, restrooms, a water fountain and a bicycle rack. A nearby shop sells rents and repairs bicycles. The Visitor Center, located at 5533 Alabama Street, approximately one mile from the Milton Trailhead, offers parking, restrooms, picnic tables, barbeque grills, an amphitheater, a playground for children ages 2-12 and a meeting room which is available for hosting trail events or for rent by individuals. Blackwater Heritage Trail, Inc., the trail's citizen support organization, operates a concession in the Visitor Center where snacks and souvenirs may be purchased. Quad cycles and adult tricycles are available for rent with prior arrangements. The Equestrian Trailhead on CR 191 (Munson Highway) has space for car and pick-up parking, horse trailers and oversized vehicles. There is potable water, water for horses and covered picnic benches. The unpaved equestrian trail begins about one mile north from the Visitor Center and parallels the paved trail with shared bridges. About ¼ mile north from this equestrian parking area, there is a well-maintained, ADA accessible, portable toilet. Rider on Blackwater Heritage State Trail. Photo by Doug Alderson.